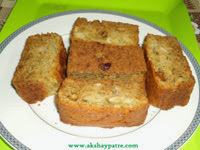 Collection of cake and bread recipes - Home made cakes and bread are always better than shop bought. It is a pleasurable moment while serving the home made cakes to family members. Home made food has an emotional touch and it can be served with great pride. Cakes, bread and sandwiches are kids friendly snacks and even they prefer to carry them in the snack box. Eggless cakes are gaining popularity and eggs can be substituted with butter to make a soft cake. I have compiled cakes, bread, sandwiches, sauce recipes for your convenience. I hope you enjoy them. Whole Wheat Honey Bread - A soft bread prepared with whole wheat flour and honey. 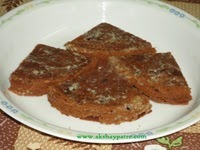 This is a healthy bread which can be used in the place of wheat flour chapati. Use of honey is totally optional. Honey gives some sweet taste to the bread. This bread can be used to make sandwiches, toast, bread upma, double ka meetha and so on. 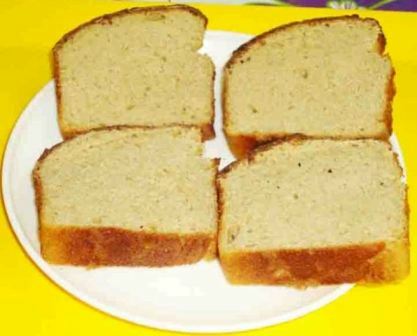 Check out the recipe and try the simple and easy to make bread. White sauce sandwich recipe - Delicious sandwich prepared with white sauce and cheese is one of the popular sandwiches in my home. This is really a delicious and classic sandwich to serve. 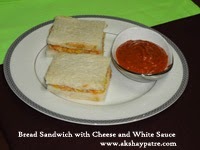 The sandwiches goes well with variety of dipping sauce and even tomato ketchup. 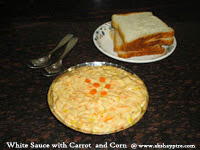 White Sauce with Carrot and Corn - White sauce is a classic sauce of North India. 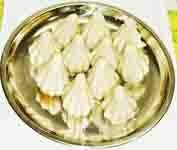 It is prepared with refined flour, milk, carrot, sweet corn and sugar. Besides sandwich, the sauce is used to make pasta dish, noodles dish. This is a nice spread on roti and chapati too. Eggless Cocoa Cake - Cocoa cake is a delectable cake with cashew nuts, pistachios and tutti frutti. This is simple and easy cake recipe. Cocoa powder gives nice brown colour to the cake. The cake is prepared with refined flour, butter, sugar, milk, corn flour and cocoa powder.